At an elegant, ostentatious wedding reception at a Knoxville, Tennessee, mansion, five women escape the festivities for a moment of calm in the bride’s sister’s bedroom. As the evening progresses, the women get to know each other and find they have more in common than a dislike for the bride—who seems to have everything but true friends. Alan Ball’s play, “Five Women Wearing the Same Dress,” written and set in the early 1990s, is a wonderfully well-written, funny, and sensitive look at the issues and struggles of young women, and Cotuit Center for the Art’s production, directed by Melinda Gallant, brings out the best in the play. Best known for his highly acclaimed HBO series, “Six Feet Under,” and his award-winning 1999 film, “American Beauty,” Ball has a fine ability to combine dark and light humor, quirkiness, and serious themes. There is a lot of drinking, pot-smoking, and light-hearted gossip and fooling around, but at its heart are some serious issues, and the ability of the women to come together over them and achieve community, if only for the duration of the wedding reception. The cast is excellent, each woman bringing her own strengths to her character’s weaknesses and vulnerabilities, presenting them not as caricatures, but as strong women with distinctive personalities. They are by turns self-indulgent and genuinely caring, annoyed and annoying, fun-loving and wounded, strong and vulnerable. And not a little catty. 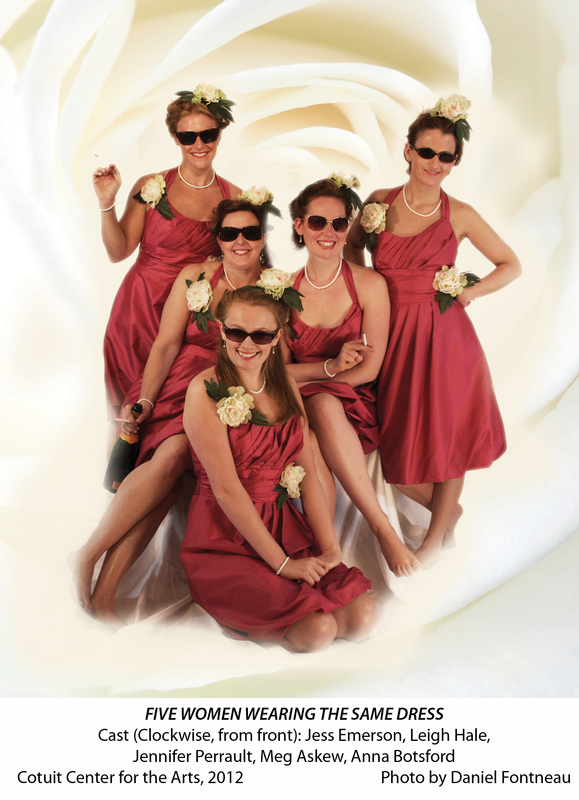 Of course, the bridesmaids’ dresses, designed by Cindy Parker, are over-the-top too—as bridesmaids’ dresses are known for being—and the pink dress with floral decorations takes on a life of its own. Meredith Marlow, played by Jennifer Perrault, is the bride’s pot-smoking younger sister, removes hers at one point, feeling more comfortable in shorts and a Tennessee T-shirt. Brash and defiant on the outside, she has a heart-breaking secret that she eventually shares with the other bridesmaids. This is the dramatic moment of the play that elevates the conversation above amusing chatter. It is Mindy McClure (Meg Askew), the lesbian sister of the groom who reaches out to her, urging her to take action. Often snacking on hors d’oeuvres, Mindy is funny and pragmatic, and fun to watch. Even funnier is Jess Emerson as Frances, the naïve and quirky cousin of the bride. She is the first one to enter Meredith’s bedroom and, thinking no one is around, tries on one of Meredith’s bracelets. Unfortunately she can’t get it off and resorts to hiding under the bed when Meredith enters the room. Devoutly religious, she protests, “No ma’am, I’m Christian,” when Meredith offers her a joint, or anyone suggests she have a drink. Frances evolves, though, during the course of the play and begins to show an interest in one of the men at the reception. But she remains endearingly funny. Georgeanne Darby, played by Leigh Hale, is the bride’s old friend from middle school, tormented by her own failed marriage and her unrequited love for the ironically named Tommy Valentine, a man who treats her badly. Hale is both touching and funny in this role. Trisha and Georgeanne reflect on love and marriage, society, and the differences between the bride (she would be the “Do” girl in Glamour magazine) and themselves (they would be the “Don’t” girls), and what friendship really means. There is one man in this all-woman cast, the charming and funny Troy Davies as Tripp Davenport, an usher who just might turn out to be a decent guy. The stage is set lengthwise along the side wall of the theater, and seating is at cabaret-style tables, which gives one a place to rest one’s drink (and notebook, should one happen to be a reviewer—and I am grateful for this), and encourages socializing with others at your table, which can be an added bonus of a night at the theater. We happened to sit with a very engaging couple with a long-time interest in the theater. The set is a richly furnished bedroom, beautifully designed by Spencer Hallett, complete with fancy bed linens, decorations, posters, and high-school ribbon awards—just the sort of place the sister of the bride might inhabit. It has a realistic three-dimensional feel, as characters can walk into the closet and the bathroom. The theater itself is decorated with pink paper wedding bells, and the bar becomes the wedding reception bar. There are lots of alcoholic and non-alcoholic drinks to choose from –and you can buy some quite yummy wedding cupcakes for only $1. 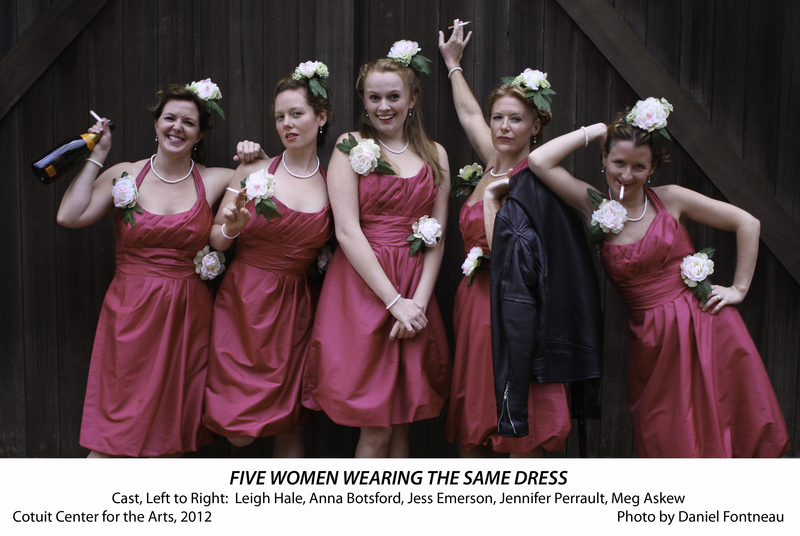 “Five Women Wearing the Same Dress” continues tonight through September 30, with performances Thursday, Friday, and Saturday evenings at 8 PM and Sunday afternoon at 4 PM. Tickets are $22, $19 for seniors, $17 for members, and $15 for students. Group rates are available for parties of 10 or more with one payment. To purchase tickets or for more information, visit artsonthecape.org or call 508-508-428-0669. Cotuit Center for the Arts is at 4404 Route 28 in Cotuit.